Easily, automatically whip up a "day in the life" composite video from clips that might otherwise stay trapped in your phone. If you cared enough to capture a moment on video, then you care enough to remember, view, and share it. 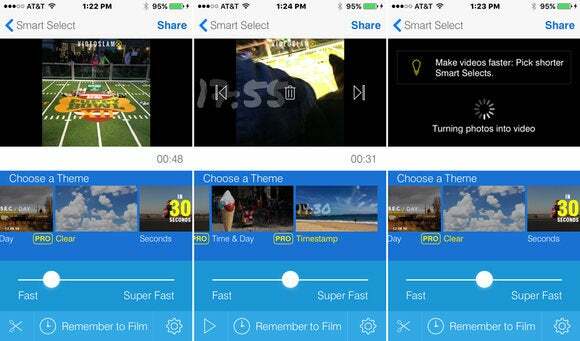 That’s the idea behind VideoSlam, a free iOS app that launches Thursday. While we may love our memories, often we’re too busy creating new ones to bat an eyelash at yesterday’s, last week’s, or last month’s—at least not until we have to empty out our Camera Rolls to make room for more. 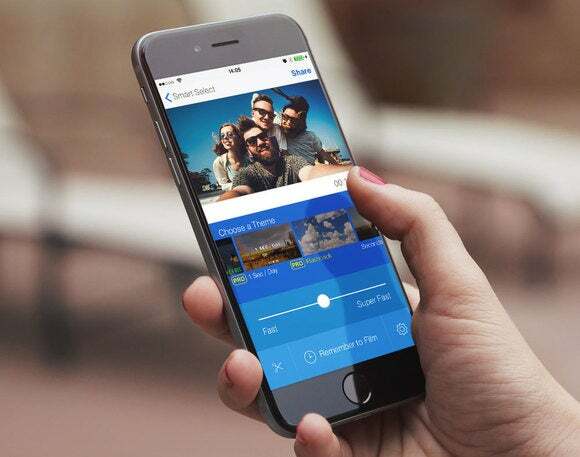 VideoSlam takes all the footage from your iPhone—up to hundreds of photos and videos—and automatically assembles them into fast-moving composite video reels that cover specified time intervals. The app naturally “smart selects” Last Hour, 24 Hours, Today, and Instagram My Day. It reads time stamps from Yesterday, Last 7 Days, Last Week, 2 Weeks ago, This Month, Three months ago, 6 months ago, and even This Month Last Year. VideoSlam was kind enough to give Macworld a prerelease version to try out, and within minutes, I was enjoying composite videos and slideshows in a way I would not have otherwise, even with Google Photos, which cleverly creates cute animations with your still images. When you launch the app, VideoSlam immediately populates each time category so you can see which images and stills are available for that interval. A solid color means you do not have anything for that time frame. The app’s output, which is in chronological order, has a natural feel, eschewing filters and effects: Its themes add only date, time, and locations for context, if you want. Interestingly, an entire shoot I did in early February did not show up automatically because it did not technically fit into those exact time frames. If that happens, just pull any images and videos you want into a separate album for the app to work its magic. A tiny scissor icon at the lower-left lets you scroll through each set of images or clips to remove single items from the reel that you don’t want included. An adjustable slider lets you choose between fast and super fast, and all speeds in between, with dynamic previews of the final video in the window. Swipe down from the top of the window to discover that VideoSlam works with images and videos, either separately or together. 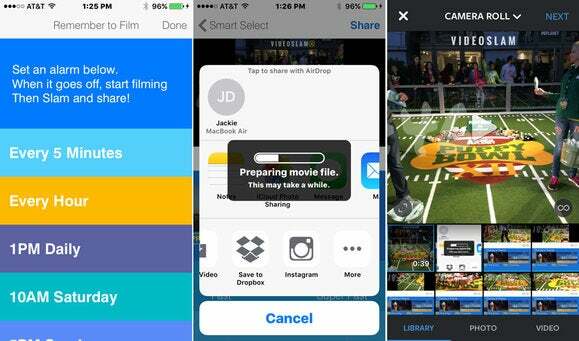 If you just shoot still images, you can use the app to make a sweet slideshow. The app’s Remember to Film button encourages you to keep shooting short clips. You can set alarm-based notifications for filming at specific times. Then, when you hear the alarm, you can film, slam, and share immediately to Facebook, Instagram, Whatsapp, and others. VideoSlam is great for people who treat video like snapshots in which they record a few keepsake seconds in time as opposed to consciously telling a story or building a narrative—just let the app do that for you. 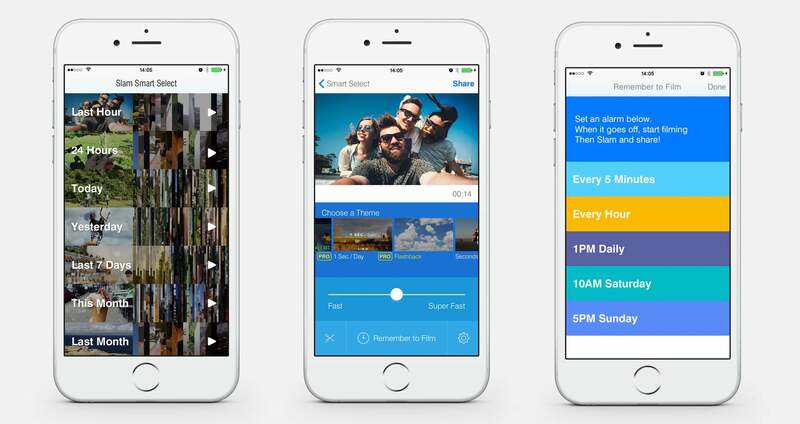 It’s also handy for travelers, creative folks, instant event recaps, video blogging, and more. VideoSlam is free in the App Store and works with iOS 8 or later. Premium themes are available as an in-app purchase for $1. These include Travel, Day in X seconds, Time & Day stamp, Count Weeks, and Periodical. For $4, you’ll get the premium themes plus editing tools and watermark removal.